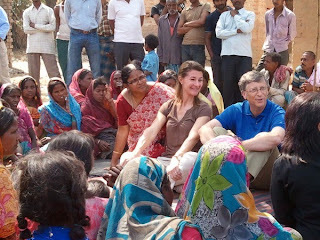 Bill Gates along with his wife Melinda Gates and a delegation of Bill & Melinda Gates Foundation are on a visit to India. They are going to visit Bhiar (a State in India), to see the progress of philanthropic works of the Foundation. Bill Gates had tweeted as "It’s great to be back in India – Melinda and I are headed up to Bihar to see the progress they're making of particularly tough problems"
Melinda French Gates had mentioned India as "hotbed of innovation ". Take India, for instance, where I am visiting this week. As a result of its large population and many other factors, India has the highest burden of maternal and newborn deaths globally (22 percent and 28 percent respectively) and almost half of the world’s malnourished children (more than 55 million). The rest of the health data paint the same picture. Another US Billionaire Warran Buffet is also visiting India. Buffett said the U.S. economy was improving and that the devastating earthquake in Japan would not hurt global growth. This is his first visit to India. And, he said in Bangalore (An Indian City) "India is a very logical place to look so I hope I spend some money here". "I don't consider India as an emerging market, I consider India as a very big market. We continue to look at large countries like India." Buffett is also using his visit to India to encourage philanthropy. He is ranked the world's third-richest man by Forbes magazine.